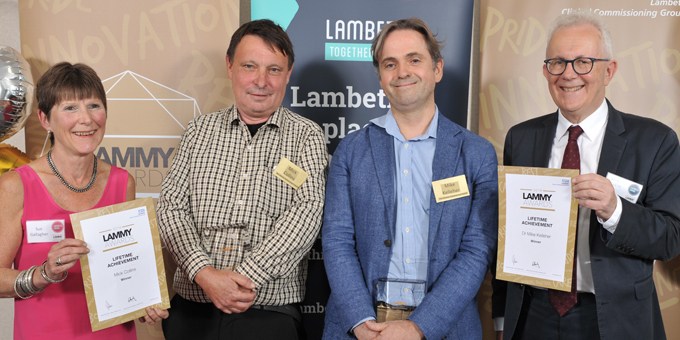 Consultant Mike Kelleher put Lambeth’s addiction services centre stage when he and Mick Collins received a Lifetime Achievement 2018 Lammy Award. In his acceptance speech, thanking Councillor Ed Davie for nominating them Mike « a mere 49 years of age » said the award was really for colleague Mick Collins who retired this year, « a tireless champion for those dependent or addicted to alcohol and drugs in Lambeth. Mike went on to chart the recovery journey of the addiction service itself. « When I became consultant in 2003, South London and Maudsley (SLaM) services were spread across Marina House – the specialist consultant service, the CLAS (Community Liaison Addiction Service team – the GP shared care service and the Stockwell Project, essentially a voluntary sector service run by SLaM, and I use the term run by loosely. Part of my remit, as I understood it was to bring some order to this chaos and bring Marina House’s specialist skills to bear on the entire system. I think when I sallied forth from Denmark Hill, there was perhaps little understanding that Mick and I were both from Cork; indeed, as they would say at home, my people knew his people and this allowed a strong mutual understanding to develop. I quickly learned that perhaps we were less special at Marina House than I thought. Service users who were barred from Marina house for behaviour, a building with airlocks, Perspex screens and high counters, would go to Stockwell or Clare Gerade at the Hurley clinic on Kennington Lane and receive treatment without problems. The service user voice was strongly embedded in everything Mick and Stockwell did and was resistant to some of the more paternalistic interventions. I recall Mick in the spring of 2004 introducing me to the commissioner Wendy Miller and Drug and Alcohol Action Team coordinator Becca Walker who informed me as a borough Lambeth was failing, badly, in performance, with nine month waiting times and poor retention in treatment. It was quite a shock to me that others did not view us with total positivity. Mick; however, had a plan. Following this series of epiphanies we set out, with the support of our psychology colleague Dr Luke Mitcheson to change addiction provision in Lambeth extending shared care with the support of the Lambeth PCT’s (Primary Care Trust) addiction lead GP Adrian McLaughlin, by embedding an addiction worker in nearly every GP practice in Lambeth; removing barriers to treatment by introducing walk-in treatment and same-day prescribing; and bring services together into a single team base at Lorraine Hewitt House in Brixton. In 2010, with Denis O’Rourke and Kenny Gregory (commissioners), the Lambeth Addictions Consortium was created bringing Addaction, Phoenix and Blenheim together to provide a unified addiction service across the whole pathway. Subsequently, Lambeth’s substance misuse social work team joined. I thank all our partners in the consortium for a fantastic working relationship. « Our service users are not a popular group with the wider public; this lack of popularity masks the fact that the bulk of mortality and morbidity in adults under 50 is directly or indirectly related to drugs and alcohol. Over half of psychiatric patient suicides involve those thought to be dependent on alcohol or drugs; in the region of a third of suicides in the general population in London involve people intoxicated with alcohol. The leading cause of death in women in their 30s is accidental opioid overdose. The leading cause of liver disease in the UK is alcohol, the third most common cause of liver disease is hepatitis C- almost all hepatitis C in the United Kingdom is related to IV drug use. The prevalence of smoking in the general population is 15%; in alcohol dependent patients it is over 80%; in drug dependent it approaches 100%. Unsurprisingly these addictions’ patients have extraordinary high levels of Chronic Obstructive Pulmonary Disease. It is important to note those who have supported us in this journey. Firstly and most importantly our service users, represented here today by Martin McCusker and Rosie Flexor. The service user voice is embedded in every level of the consortium. Without their involvement and at times public voice, the consortium would not be in existence. No service can or should run without a strong service user voice. In these developments I have to add we have had the support of the South London and Maudsley NHS trust, I would note especially Professor Sir John Strang and former Addictions Division director Mark Allen. I thank Lambeth Clinical Commissioning Group, for its support; in particular I note the longstanding vision of Denis O’Rourke to develop the consortium and Adrian McLaughlin for his consistent support, even after we left CCG commissioning. It is no secret that there are no fully medically staffed detoxification units in London, a significant gap in service provision, and both along with Moira McGrath (NHS Lambeth CCG) supported a pilot with the Alcohol Liaison team in St Thomas’s to admit medically complex detoxes to St Thomas’s. I think we would struggle without the ongoing support of the local authority; including our commissioner Jade Holvey, Michelle Binfield and Fiona Connolly. I also would like to thank the elected members for their support especially Ed Davie as a champion of our service, Jacqui Dyer as joint chair of health scrutiny and Jim Dixon as previous chair. Over the years we have had the support of many other councillors, including Angie Meader, Rachel Heywood and Paul McGlone. Thank you again to the Judges and thank you Mick for all your contributions to addiction treatment in Lambeth for 30 years. Pictured left to right: Sue Gallagher, Lay Member of Lambeth CCG Governing Body, Mick, Mike and Sir Hugh Taylor, Chairman of Guy’s and St Thomas’ Foundation Trust. Click here to read how Kevin has benefitted from this service.